You are interested in finding a full-size sedan with a design that was carefully put together. 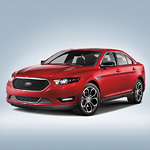 When you come to our Kinston showroom, we will help you see how the Ford Taurus and its design fit with your life. When other cars are driving toward you and meeting you on the road, you want them to pay attention to the front end of your vehicle. The front end of the Taurus has a great design and it is accented by a bold grille. The grille on this vehicle helps to set it apart. The lighting on a vehicle should not only help it show up so that you are noticed and can stay safe, but it should help the vehicle have a look that is all its own. The LED lighting on the Ford Taurus has a look that sets this sedan apart from the others driving around it.